Drain Repair, FishHawk, FL | A Step Above Plumbing Inc. Drain Repair, FishHawk, FL | A Step Above Plumbing Inc. If you think you need a drain repair in your sinks or tubs at your FishHawk, FL home, give us a call at A Step Above Plumbing Inc. Drain clogs can mean serious business if they get bad enough. If your sinks or tub are slow to drain, you may need to consider a drain repair. You could use chemical drain cleaners to try to clear the clog yourself, but over time they tend to cause damage to pipes. Your safest bet is to give us a call. If you do conclude that you need a professional drain repair, you should schedule it as soon as possible. Procrastinating drain repair could cause major damage to your home. If the clog leads to a backup, toilets, tubs, and sinks can overflow with contaminated water and damage flooring and even your belongings. You may have saved money 3 days ago by not paying for your drain repair, but if backup leaks into your home, you’re out even more money than if you had just repaired the drain professionally at the start. 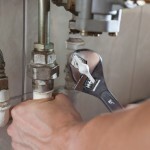 If you think you need a drain repair in your sinks or tubs at your FishHawk, FL home, give us a call at A Step Above Plumbing Inc. We pride ourselves in being on time to appointments, and we even offer weekend appointments, so you can guarantee that your time will not be wasting by choosing us for your drain repair needs. Give us a call today to learn more or to receive a quote for your drain repair issue.